A little while back, Nate & I threw together a few sets of photos featuring a couple of the characters from the Dance Central series we had done costumes for before in “casual” settings. Jaryn & Oblio questioning Oblio’s wardrobe choice at a “party” at Glitch’s place, Kerith & Aubrey having a sleepover — we just enjoyed joking around with what these characters might be doing and wearing when they weren’t out dancing up a storm and/or snarking at Dr. Tan (or snarking at everyone in the case of the Glitterati). When talking with Bria of White Hot Room one day, we thought it might be fun to expand the idea and include other characters — figure out outfits for them to wear; accessories and clothes that would fit their style and personalities. Plus, we just apparently really like goofing off as these characters and Katsucon was the perfect opportunity to bring all of it together! Together with Bria & Lin, the ladies of White Hot Room (who were Emilia and Dare, respectively), we were joined by our friend Denis (as Glitch) on the Thursday night of Katsucon for the start of this project. Later in the weekend we’d all be dressing up as the same characters in some of their outfits from the games for costume shenanigans! You know how we feel about the Glitterati (<3), so Nate and I thought we’d put something together for them. We knew they had to be similar enough to one another to work for Kerith & Jaryn and we wanted to stick with dark colors to balance out the light hair – also for the fact that we wanted Jaryn’s necklace and Kerith’s bracelet to pop more. The wigs we wore that night are actually the unstyled wigs we’ll be using for their DC3 outfits for PAX East! Everything for their outfits was black except for our gray shirts and my giant disco ball heels. It was nice to actually be somewhat within a foot of Nate’s height instead of a foot below and since these were “casual” outfits and not outfits to dance in, I could wear heels! GIANT. DISCO BALL. HEELS. The other things that weren’t black and/or gray were Jaryn’s necklace and Kerith’s bracelet, which were both purple Firejewel neckalces and lit up – you know we can’t resist shiny things! We figured all of these items together would work as small callbacks to both of their outfits from Dance Central 2 without being too over the top. Just a casual outfit for a night of snarking at people and having a drink or two, not amazing the world with their uber-dance skills (HA, we wish we had those). As for our dear friend Denis, he wanted to put Glitch in something classy and wore a suit with a color scheme that matched DCI’s colors. Basically, he got all fancy and as you can see, the Glitterati are questioning this quite heavily. Below are a couple more shots we took that night. We had a lot of fun with this, as silly as it grew over the course of the evening (Emilia was singing a song from The Lion King to Kerith at one point – thank you to whoever was playing that in the Gaylord National atrium ;D) and we always look forward to working more with these awesome people (which spoiler alert: WE WILL BE *cue ominous music, etc.*)! 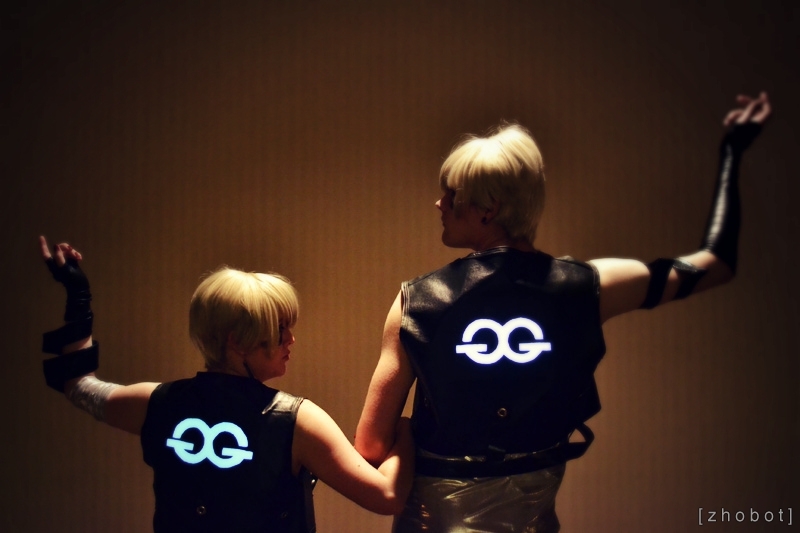 For more photos and also info on our lovely Emilia & Dare, check out their post on Casual Central over at White Hot Room from earlier today and keep your eyes peeled for some more of this project – and other Dance Central projects – in the future (we’re already planning other characters/outfits)! Next story Eastern Shore Fan Con 2013! Previous story Merry Christmas & Happy Holidays!